On our last full day at this year's Lone Pine Film Festival, my 12th and final film of the weekend was THE ARIZONA RANGER (1948). 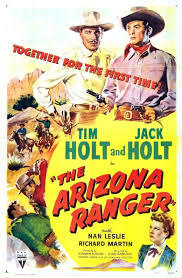 THE ARIZONA RANGER was one of the best Tim Holt Westerns I've seen. It had a fairly atypical story; instead of Tim and Richard Martin's Chito being footloose cowboys looking for work or visiting friends, Tim plays Bob Morgan, a young man just out of a stint serving in Teddy Roosevelt's Rough Riders. Chito is a ranch hand who has come of age on the ranch run by Bob's dad, Rawhide (Tim's real father, Jack Holt). Though proud of his son, Rawhide is dismayed when he learns that Bob hasn't come home to work on the ranch, but has instead accepted a commission serving with the Arizona Rangers. They quarrel, and Bob leaves the ranch with his fellow army buddies and Rangers, Gills (Richard Benedict) and Mac (William Phipps). When Rawhide later catches Quirt Butler (Steve Brodie), who he believes has murdered his old friend (Paul Hurst), he plans to administer frontier justice and lynch Butler. When Bob interrupts the lynching, insisting that Butler stand trial, it seems Bob's relationship with has father will be irretrievably broken. Then Butler is broken out of jail and Bob is relieved of his position in the Rangers, but he's nonetheless determined to bring Butler back in for trial. This was a very good, meaty story with more dramatic heft than the usual Holt film. 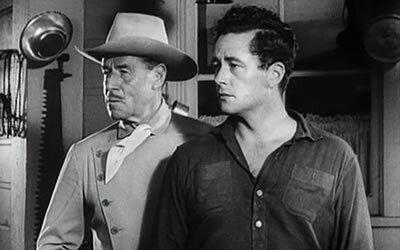 Jack Holt's Rawhide is an irascible coot whose anger with his fine, responsible son is fairly irrational -- but that makes him all the more interesting. His inability to tamp down his personal disappointment and clearly see his son's worth might not be reasonable but at the same time is a recognizable human failing. It's almost seems as though Chito spends more time in this film with the senior Holt, who has brought him up on the ranch and considers him his top hand, despite his periodic goofiness. Chito's light comic moments are all the more needed in this film given its serious nature. Adding to the somewhat darker feel is the abusive relationship of Butler with his wife Laura (Nan Leslie); indeed, Bob stops Butler from manhandling his wife in the middle of town. Unspoken, burgeoning feelings between Bob and Laura are complicated by the fact she's married and also that she must lie about her husband's whereabouts to save Bob's life. This is a well-paced, well-acted film which has pretty much everything you'd want in a "B" Western, including a good story and beautiful locations. 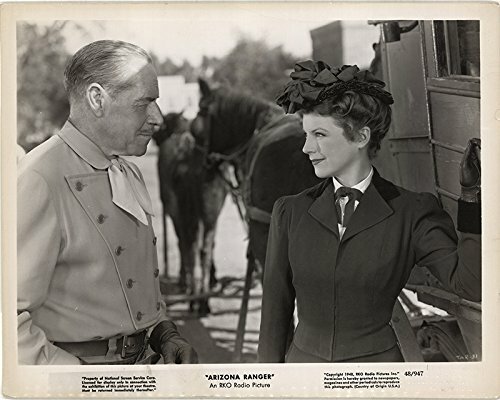 THE ARIZONA RANGER was filmed in black and white by J. Roy Hunt in Lone Pine, California, as well as Southern California locations. THE ARIZONA RANGER is a 64-minute film which was written by Norman Houston and directed by John Rawlins. This film is not on DVD but has been shown on Turner Classic Movies. 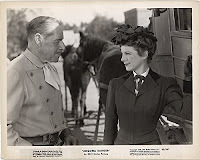 I remain hopeful that someday the Warner Archive might release a final collection of Holt films, including a handful of not-on-DVD titles along with Holt films based on Zane Grey stories which fell into the public domain and were released on DVD by Lions Gate. I knew you would love this one, Laura! You and I are both fans of the Tim Holt RKO series and obviously both find "ARIZONA RANGER" not only an excellent western but just that bit special. Jack Holt was a strong and impressive screen presence and added much to any film he appeared in. The fact he was appearing alongside his son seems to have been recognised by both of them as a special moment. This and BROTHERS IN THE SADDLE are my two favorite Holt films. This is indeed top-notch. I believe I got a little weepy watching Jack and Tim together. Don't tell anyone. Loved all your comments! It was great to end the festival with this film. I need to cross BROTHERS IN THE SADDLE off my viewing list!